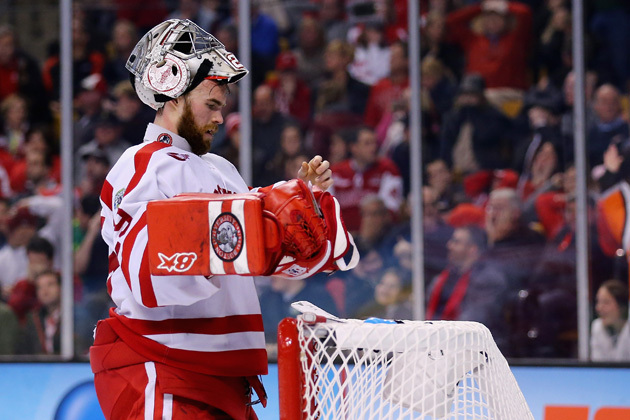 Boston University netminder Matt O'Connor must put his blunder in the NCAA Championship game behind him, as mental toughness, focus and perspective are key traits for all levels of ice hockey goalies. There are bad dreams, and then there are nightmares. Hockey goaltenders know both. But it's the nightmares that can not only cost them a game, or a championship, but also derail a career. "(Montreal Canadien Hall of Famer) Jacques Plante said it best," says Dr. Saul Miller, author of Hockey Tough and Performing Under Pressure. "He said, 'Can you imagine a job where every time you make a mistake, a red light goes on and 15,000 people stand up and cheer?' That's pressure." Boston University junior netminder Matt O'Connor knows. Coming into the Frozen Four, the undrafted Ontario native had a banner season, backstopping the Terriers to the biggest turnaround in college hockey. NHL scouts took notice after O'Connor and BU captured Beanpot and Hockey East championships on the Boston Bruins home ice, the TD Garden. The third championship game, however, would not be the charm. After a comeback win in the national semifinal against North Dakota, O'Connor and his BU teammates were battling the Providence Friars for the NCAA title. With less than nine minutes left, and BU nursing a 3-2 lead, Friar defenseman Tom Parisi lofted a harmless dump-in toward the Terrier net. It was such a routine play that Parisi turned for a line change the moment the puck left his stick. O'Connor caught Parisi's pop fly, but in a split second of indecisiveness, he hesitated as his defensemen circled back. The puck slipped from his glove, and fell between his legs. O'Connor dropped to his knees, inadvertently knocking the puck into his goal. 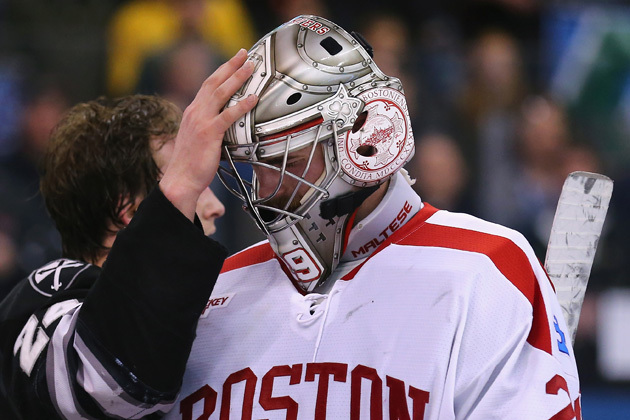 As two BU teammates clutched their helmets in disbelief, O'Connor looked agonizingly into his empty mitt. It was a soul-crushing gaffe. "As a goalie, you feel for a bounce like that," says Gillies, who signed with the Calgary Flames this week. "You've been there, so you know the bottomless feeling that it presents." The key phrase is, "as a goalie." The position carries unique pressures that few positional players can fully appreciate unless they've spent time between the pipes. But all goalies, from 6-year-olds to the NHL (especially those now playing in the Stanley Cup playoffs), are all too familiar with the weight of expectations. 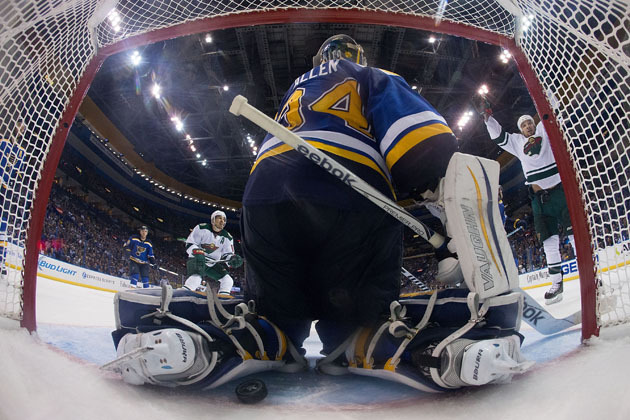 St. Louis Blues goaltender Jake Allen felt the heat after he gave up two embarrassingly soft goals against the Minnesota Wild in Game 6 of the opening round, costing his team the game and the series. Bad goals magnify that burden. Worse, goalies can't actively atone for a mistake. If an infielder boots a grounder in baseball, he can make amends next time he bats. But a goaltender must wait for the game to come to him. ​​"The difference between good goalies and really good goalies is having patience," says Brian Daccord of Stop It Goaltending, a former goalie coach for the Bruins. "That's mental toughness." So how does a goalie recover? In the moment, Miller suggests taking a deep breath and reiterating key concepts, like staying square to the shooter. In the big picture, however, it's essential that goalies cultivate a positive mindset. "Everybody gets scored upon," says Miller. "Maybe not quite as dramatically, or in the theater that this was, but everyone gets scored on. So you have to learn, as a goalie, how to let it go and get back to the present. The mantra is, 'Next shot. See it, and stop it.' That's all the goalie should be thinking." Dr. Dan Schaefer, author of Click! The Competitive Edge for Sports, Entertainment, and Business, says the subconscious mind plays a vital role in a goalie's ability to "bounce back" from a bad goal. Negative thoughts can become self-fulfilling prophecies. "What's the internal conversation?" says Schaefer. "Most self-talk is negative, and it's contaminating." ​Schaeffer employs hypnosis to help clients uncover hidden mental riddles, solve them, and take ownership. "How do you control your mind game?" he says. "How do you talk to yourself going into the game? How do you identify and eliminate distractions?" Both Schaefer and Miller draw on examples from the animal kingdom to help goalies quickly regain focus. Schaeffer prefers the rhinoceros. "A rhino is the only animal that never backs up," he says. "He just keeps moving forward." Miller likes big cats. When a lion fails to catch an antelope, it doesn't wallow in self-pity. "There's no negative judgment," he says. "It's always about getting after the next one. So it's a training thing. It's teaching people a process." Following the NCAA championship game, O'Connor faced the music. The 23-year-old sat in his stall, answering question after question about a mistake he couldn't explain. That post-game performance, say sports psychologists, was an important first step. "There’s nothing like public humiliation to test your mental fortitude and humbleness," says Dr. Adam Naylor, director of Telos Sport Psychology Coaching. "If you're not willing to be embarrassed, it's tough to play freely at the highest levels. "When it's time to compete, the great ones look ahead rather than look back," he said. "The past has been mourned and put into perspective. Now it's time to play and write the next chapter." Perspective also allows goaltenders to remember all the important saves they've made. BU's Hobey Baker winner Jack Eichel confirmed that his teammates understood O'Connor's performance was a major factor in the Terriers reaching the Frozen Four. "The one thing about goaltending is that you always have to prove yourself," said Daccord. "It never ends. Whether you give up a bad goal, or win a Stanley Cup, you have to prove yourself. " Matt O'Connor will undoubtedly welcome that opportunity.